Naomi Gingerich, author of the blog "The Cooks in the Kitchen." I learned about the importance of tradition while rumbling across gravel roads in a 1972 Chevy station wagon with my father. Every week we made the trip to a stark, white farmhouse nestled between tall pines in Holmes County, Ohio for a pan of freshly baked cinnamon rolls. The smell of kerosene lanterns and wood smoke met us at the kitchen door as Mary, the Amish widow who operated the bustling bakery in her home, came to greet us, a smile stretched across rosy cheeks. We would lean against the counter, chatting pleasantly in the Pennsylvania Dutch dialect of the Amish and Mennonites while nibbling on rolls, straight from the oven, their brown sugar frosting finding its way down our fingers and onto our chin. Later, a pan of goodies between us, we made the short drive home to our own farmhouse, where, most likely, my mother was in the kitchen baking bread. I “caught” a whole lot of things in those childhood years, and the traditions of our culture became an important part of my life. The community we cultivated with friends and family provided a nurturing environment with memories galore. There were ice cream suppers with neighbors who came walking across fields with pails of home-churned goodness. There were bountiful Sunday potlucks to enjoy after hours of sitting on hard pews listening to the drone of the minister. There were apple butter stirrings and taffy pulls with aunts and uncles. And always there were daily gatherings around the table. My father often reminded me, “The best time in your life is when your children have their feet under your dinner table.” I thought it was funny then, back in the day when I wore plain Mennonite dresses and a traditional white cap to cover errant curls. Passing bowls of food and tipping cups with my kinfolk was as sure as the sun that set over our fifty acres each night. It wasn’t until later (and after children of my own) that I realized the importance of family dinners in an era where fast food threatened to crowd out home cooking. I learned to appreciate the culture of slow living which made time for sit-down dinners where everyone was present, and mealtimes were punctuated with hearty laughter and storytelling. At the core, we celebrated life over plates of food around tables with those we loved. 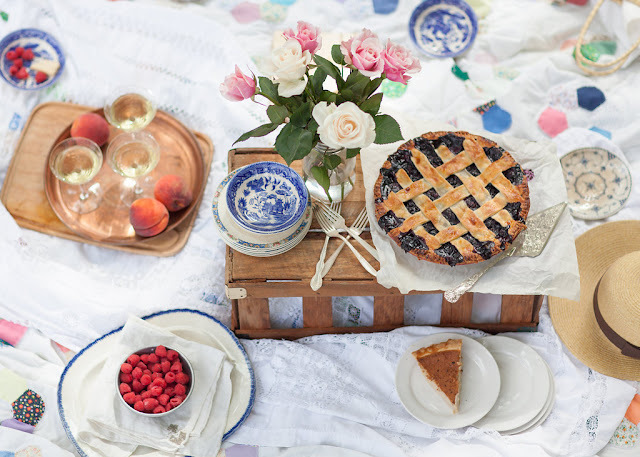 A picnic on my mother's quilt under the Oak tree. When I left the Mennonites at age 23, I determined to carry this tradition of family dinners into my own home when my husband and I got married. Over the years, my table was filled with our children and friends, and then friends of friends, and eventually a long list of guests who came to dine. It became inevitable this love of cooking and feasting would one day expand beyond the walls of my home. In 2007, we moved to North Carolina, and, to make room for more guests, I moved my dinner parties outdoors. Now, in scenic locations throughout the state, I set tables under live oaks, in back yards and on porches, recreating the intimate experiences of my childhood. Sometimes the dinners are well-planned events and at other times they are last minute potlucks where everyone brings a plate and pulls up a chair. As one might expect, they have become the backbone of building friendships in a land far from our kin. 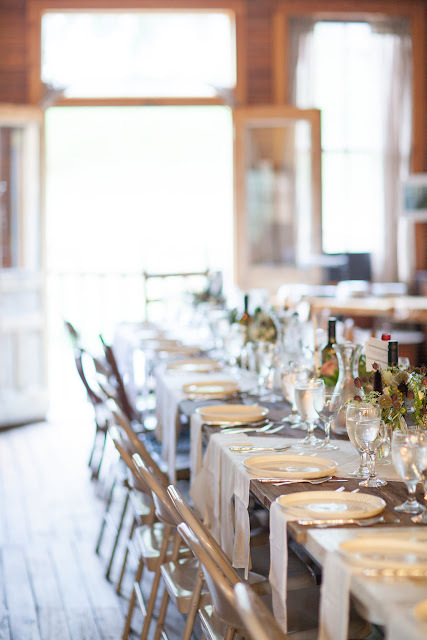 A dinner to honor the arts and crafts heritage of Appalachia. This commitment to family dinners led me to start a blog and Instagram account in 2014, The Cooks in the Kitchen, which created a platform for me to share stories and recipes of my heritage, in addition to those of home cooks around the world. Through this, I have met incredible women (sisters, really) who are passionate foodies, but, more importantly, share my conviction of nurturing families and carrying on the tradition of home-cooked meals. I’ve met women like Abigail Bordigioni (@thecreativepalate), a winemaker from Sonoma who left NASA to paint, make wine and raise her two kids in a 1900’s farmhouse. Seattle’s Deborah Balant (@rainydaybites) and her online cookbook club introduced me to a variety of cuisines as we worked our way through a different book each month. Hazel Seah (@beurrenoisette_) from Singapore inspired me with her dedication to carry on heritage recipes such as Prawn and Pork Dumplings. Asha Sivakumar (@foodfashionparty) influenced me to add a whole new section of Indian spices to my cupboard with her easy-to-follow cooking from her San Francisco kitchen. Susy Villasuso (@holasus) a London chef-turned-mama, gave me confidence to try dishes inspired by her native Mexico, and Toronto’s Jennifer Emilson (@thelemonapron) took my idea of flavor combinations to a new level. These women hail from various continents, countries and cultures, but, at the core, are committed to family, heritage recipes and dinners around the table. And I’ve been honored to tell their stories. Peachy Blueberry Pie in my mother's enamel pie pan. 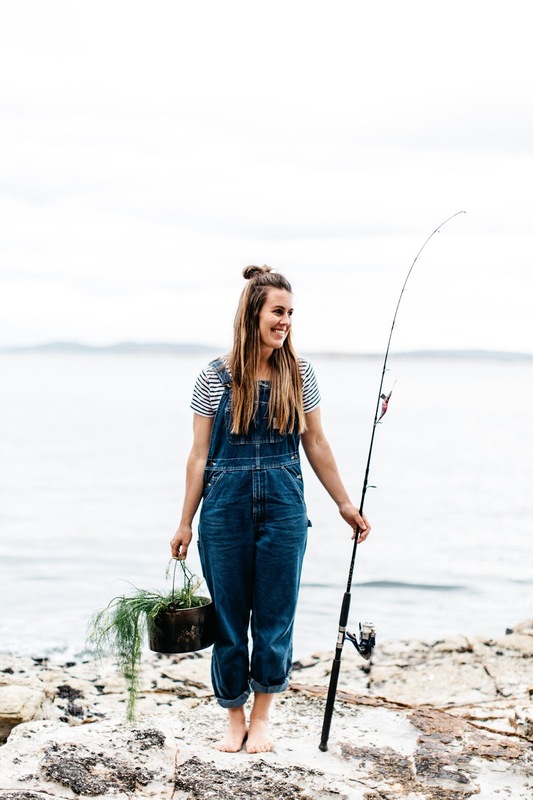 One of the most unusual stories I’ve told is of Australia’s surfing chef, Sarah Glover (@misssarahglover), a 27-year-old from Sydney who carries a surf board and a camp stove in the back of her Land Rover. Her out-of-the-box creativity reflects pure pleasure as she hovers over her outdoor camp stove or an open fire. Whether preparing a freshly caught fish or stirring a steaming pot nestled in embers, her billowy skirts hunch about her as she intuitively seasons, stirs and serves up romantic dinners ocean-side or on tables set in the Outback. A keen dedication to family (she is one of eight kids) and a compelling thirst for adventure often finds Sarah and her siblings on cooking and surfing trips along Australia’s untamed coastline, relying on the sea to provide the evening’s dinner. Stories like Miss Glover’s are fun to read, but they’re also inspiring. And that’s what draws people to my blog. It’s fascinating to learn how food is cooked in kitchens across the globe and it’s interesting to see that no matter the culture, women generally share a basic instinct to prepare food and nurture their families. 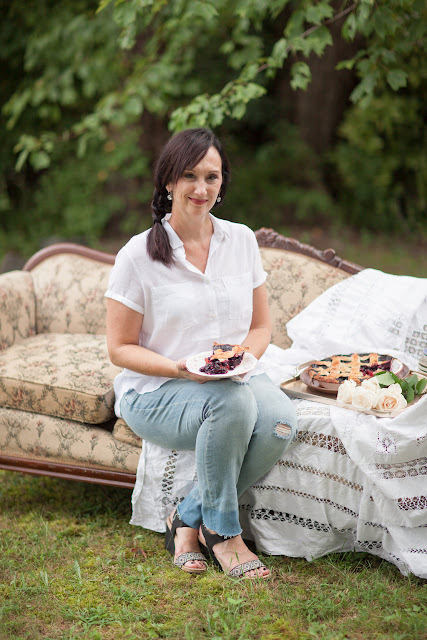 Sarah Glover, author of the soon-to-be-released cookbook, Wild. I’ve had a lot of feet under my table over the years. I’ve set out the Blue Willow for artists and musicians, college students and diplomats. I’ve rubbed elbows and traded stories with the rich and the poor as candles flickered and faces glowed with the passion of conversation. I’ve learned that a table melts differences and brings people together on common ground as we meet a basic need for survival – that of nourishing our bodies with food. And in the process, we nourish our souls, as well. I may have traded the Amish countryside for life in the foothills of the Blue Ridge, but I’m still a promoter of roots and embracing one’s heritage. Though my parents have passed on, my father at the age of 100 and my mother at 91, others are carrying on the tried and true traditions of their generation. For me and my family, that looks like dinner around the table. 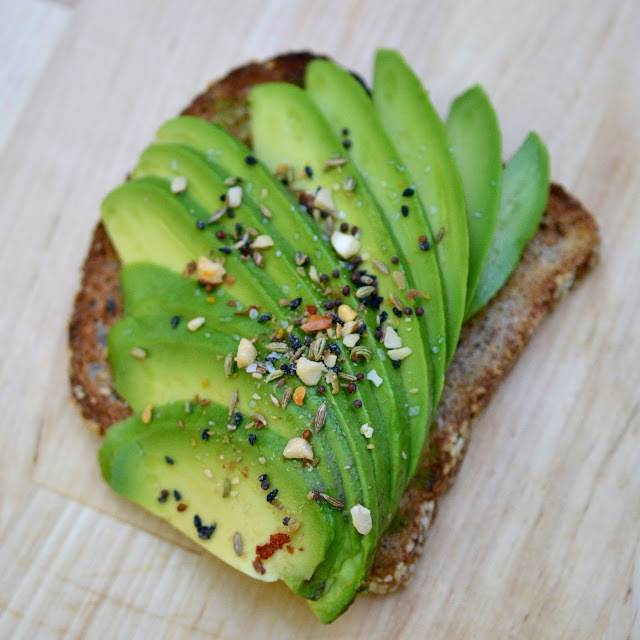 Avocado Toast with Margie's Mumbai Nut and Spice Mix. From the arid cowboy country of El Paso, Texas to the Queen City of North Carolina, Margie Bruner has lived her life in awe of nature's beauty. And when it came time to start a creative business she really loved, she chose to focus on one of her passions - natural foods grown from our "God-created" earth. After coming across a recipe for dukkah (a nut-based spice blend often sold on the streets of Egypt), she began experimenting with chopped hazelnuts and a spice blend of her own which she was soon adding to everything. 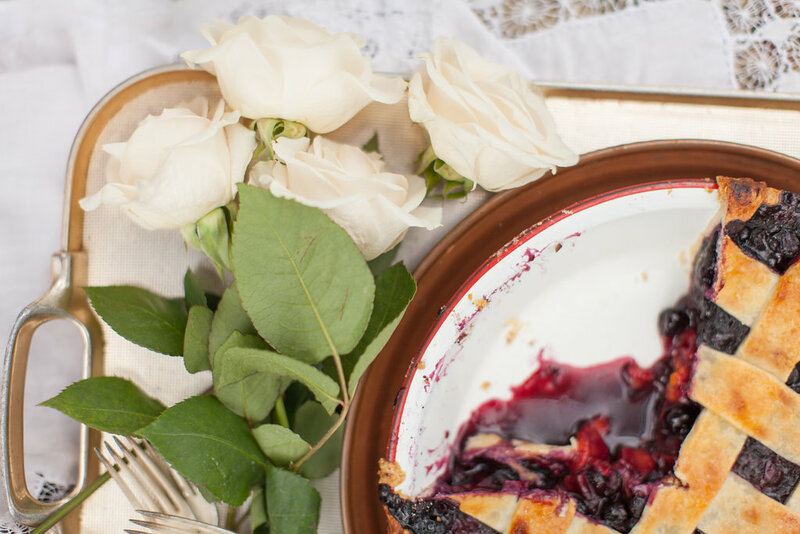 It wasn't long before she realized she had found her niche, and Glory Kitchen was born. Today, Glory Kitchen Nut and Spice Blends are available in 6 different flavors representing Asian, Mexican, Indian, Italian, French and Middle Eastern cuisines. The packaging carries artful details of Margie's touch and represents the lovely and creative personality of this tiny woman with a heart as big as, you guessed it, Texas. 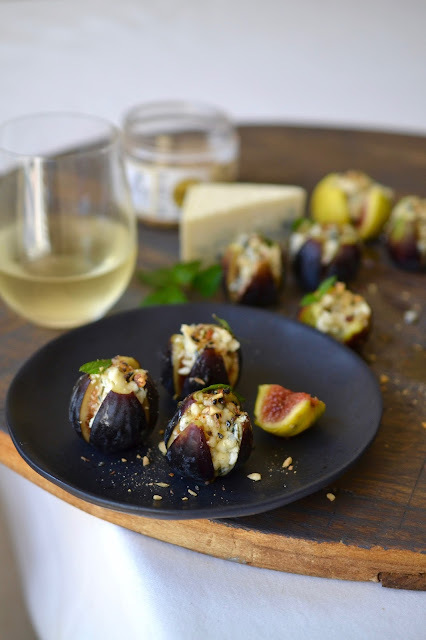 Blue Cheese Stuffed Figs with honey and Mumbai Nut and Spice Mix. Tell us a bit about your life, Margie. I live with my husband, Bob, in Charlotte, NC. We moved here about 8 years ago from Dallas, TX, where we met after college and raised our two boys. Bob and I are both native Texans but we moved to Charlotte when our boys set off to college and I joined my husband in his real estate development business. Both our boys went to college in the Carolinas and for many years we were all in close proximity to one another, which was wonderful. Now that the boys have both joined the working world, one son back in Dallas and the other in Colorado, we don’t get as much together time but we just can’t seem to leave this wonderful state of North Carolina. I have always been drawn to food and creativity of all forms so I started this little food business and called it “Glory Kitchen”. The reason for the name? I just love what the word "Glory" represents: beauty, honor, praise, thanksgiving, and I wanted this little business to represent those ideals. 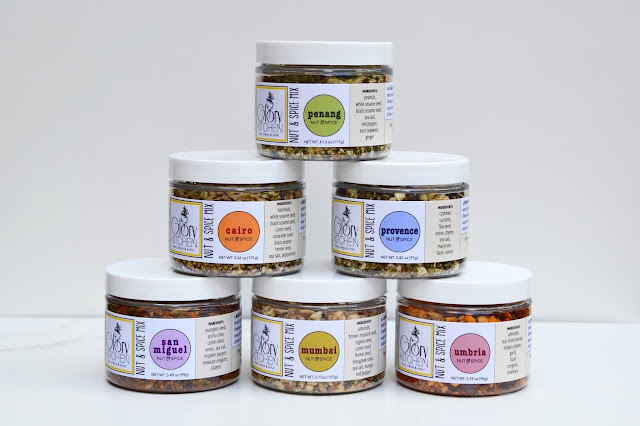 We make nut & spice mixes that add crunch, texture and flavor to everyday foods like avocado toast, noodles, baked potatoes, fish, chicken, vegetables, popcorn, you name it. They are 100% made of plant-based, good-for-you ingredients without any chemicals, preservatives or additives. Half the jar is made of chopped nuts and then they are paired with seeds, herbs and peppers from different regions of the world. We have 6 different flavors representing Asian, Mexican, Indian, Italian, French, and Middle Eastern cuisines. 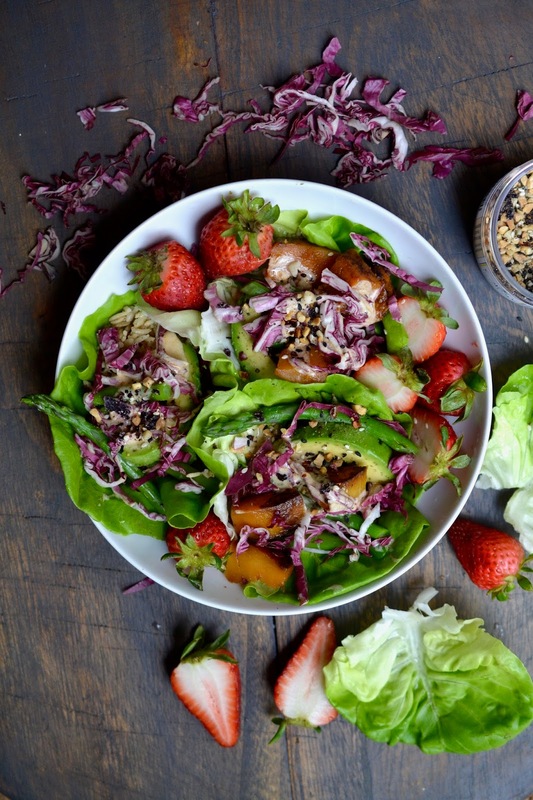 Butter lettuce salad cups with strawberries and Penang Nut and Spice Mix. Where did you grow up? Tell me something about your childhood. I grew up in the furthest part of West Texas, El Paso, where the Mexican, New Mexican, and Texas cowboy influence is strong. It is a desert, border city with cactus, mountains, and lots of hot weather. When I moved to Dallas as a young college student, I remember being wowed by the abundance of green landscape. Then I moved to North Carolina, the land of beautiful trees, and now when I return back to visit Dallas, it looks quite dry and arid to me! 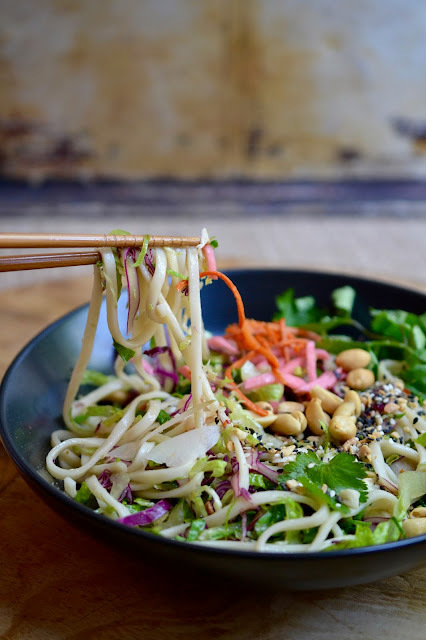 Cold noodles with peanuts and Penang Nut and Spice Mix. How did you come to love cooking? Was there an early influence in your life? I have always been passionate about focusing my diet on natural foods, grown from our God-created earth. To me, that means plants, seeds, nuts, grains, fish from the ocean, milk from grass-fed cows, and chicken raised in the true outdoors. There is real beauty in these natural resources and I believe we were all intended to eat this way. As an artist at heart, I’m extremely visual and I’ve always found such beauty in the natural shapes and colorations of vegetables and fruits. Some of my very favorite photographs are those of simple, organically shaped vegetables. The combination of creating an artful plate and a nourishing meal is my idea of perfect cooking. The wonderful feeling you get after eating a healthy meal that was made with beautiful ingredients and arranged in an artful way - that is why I love cooking. 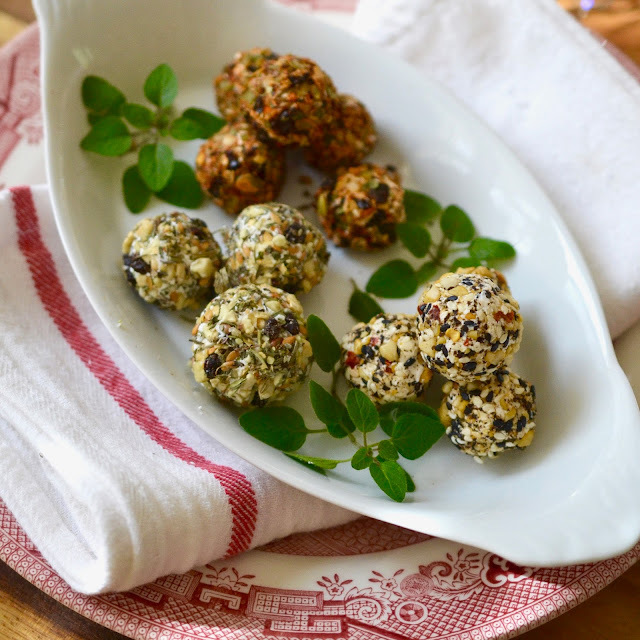 Goat cheese truffles with San Miguel, Provence and Penang Nut and Spice Mix. Have you always been in your current profession? No, my work background is in business (Investments and Real Estate), and Interior Design. I was a Financial Investment Broker before I had my two boys, I had my own Interior Design business for 25 years, and most recently I worked with my husband managing commercial real estate properties and handling the leasing of those properties. We owned a lifestyle shopping center which had about 10 restaurants and through the leasing of these businesses, I learned a lot about the food business. I was itching to start a creative business which would merge my love for healthy food, packaging design, graphics, photography and sales. 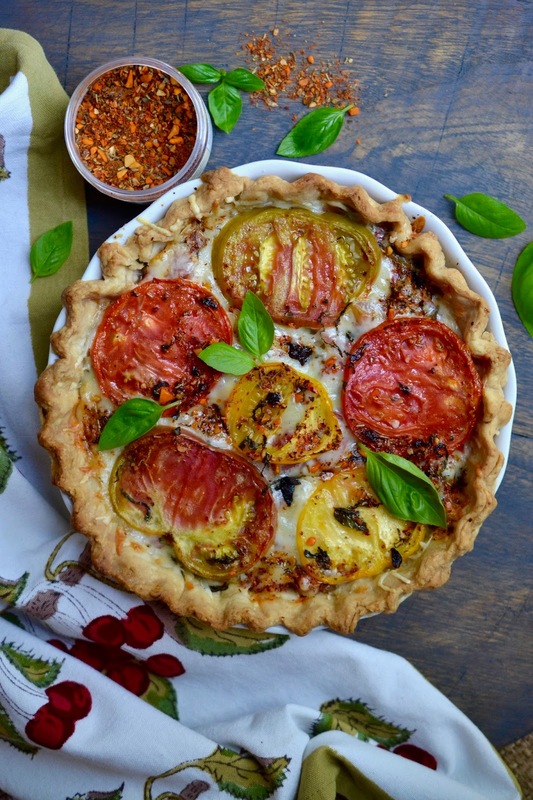 Tomato pie with Umbria Nut and Spice Mix. What gave you the idea for your spice blend business? I knew I needed to work with a product which I personally loved and would be excited to promote everyday. In my constant quest for new food ideas, I came across a recipe for dukkah, which is a nut-based spice blend often sold on the streets of Egypt. It is often sold in a newspaper cone and used for bread and olive oil dipping. My first batch was made using chopped hazelnuts and I found myself adding it to everything, avocado toast, pasta, popcorn, salads, baked potatoes, eggs, and of course bread and olive oil dipping. I knew we should all be eating more seeds, nuts and herbs, so what better way to add this to your daily diet then by creating variations of this same nut & spice blend concept. I set out to create 6 recipes sourcing from different cultures and flavor profiles but all with the same idea using nuts as a base ingredient and then pairing it with seeds, herbs, chilis and dried veggies. The result was a crunchy, savory topping which could be used everyday - depending upon your flavor mood. 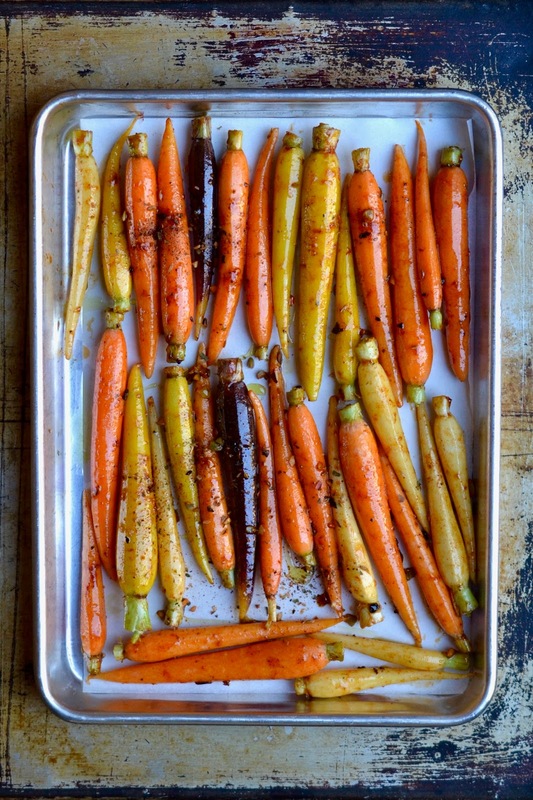 Honey-roasted carrots with San Miguel Nut and Spice Mix. All artful creations inspire me. But I would have to say gardens and architecture top the list. I’m an avid gardener and just love caring for plants and watching them grow and change through each season. One of my favorite things to do is to travel around with my husband and admire classic architecture. Building details, doorways, colorations, and the way a structure is framed with trees, flowers and plant detail is so inspiring to me. My husband shares this interest so we often find ourselves driving around to admire buildings, old and new, but typically its the old buildings which have the most wonderful character. Charlotte is filled with beautiful architectural buildings; some of my other favorite cities are Charleston, DC (the government buildings and Georgetown in particular) and NYC. 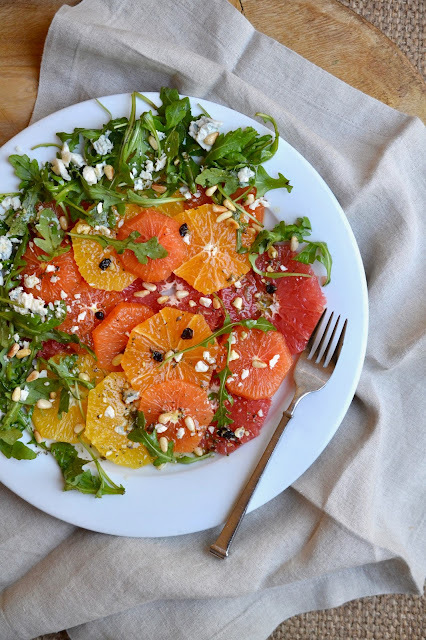 Citrus Salad with arugula, pine nuts and Provence Nut and Spice Mix. What has been the biggest challenge in starting your own business? Probably the most challenging part is when you start small, you don’t have the resources for teams of people to add their expertise in the various aspects of a business. You must immerse yourself in all areas and quickly become a jack-of-all trades to handle product creation, production, marketing, design, shipping, accounting, technology and website, social media exposure and sales. At times it can be overwhelming but it is the only way to learn and experience the business from every angle. The six blends of Glory Kitchen. “There are 7 days in a week and ‘Someday’ is not one of them”. I’m a big believer in going for your dreams, always exposing yourself to new things, and working hard to make ideas happen. Everyone has gifts and has the ability to add positive value to our world, so its important to act and make a difference. 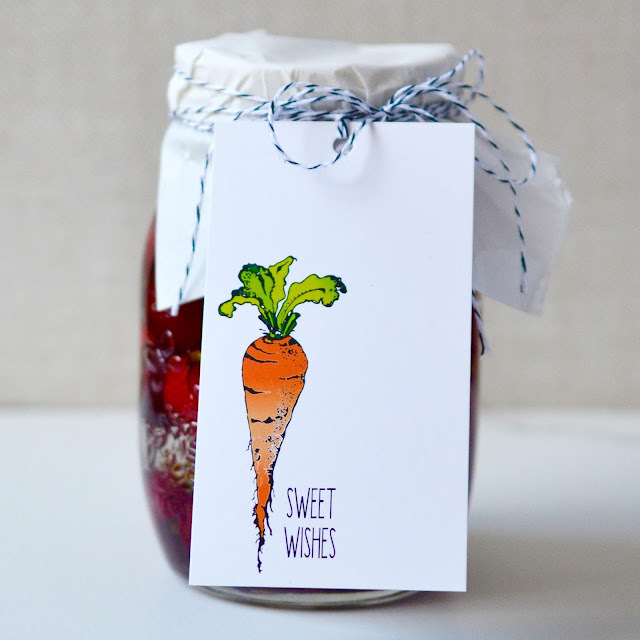 Pickled cherries with a Margie-created gift tag. What are your hobbies or favorite activities? As mentioned above, I love to spend time in the garden; pruning, planting, and creating beautiful outdoor spaces. I walk every morning, not only for exercise, but to think and create. Some of my best ideas and problem solving comes during my daily walks. I’m blessed to live in a charming and beautiful neighborhood so walking each day gives me such joy and appreciation for this city. I also love yoga, it keeps me grounded and feeling healthy. My favorite time for a yoga class is at the end of the day, at around 6:00 pm. It eases the aches and pains from too much computer sitting and is a great way to unwind and feel rested after a full day. Kimchi grilled cheese with Penang Nut and Spice Mix. Margie Bruner, of Glory Kitchen. 1. Slice Roma tomatoes in half, lengthwise and place in a large bowl. Drizzle tomatoes with extra virgin olive oil & sprinkle with sea salt. Arrange them slice-up on a baking sheet lined with foil or parchment paper. Sprinkle each tomato half with a pinch of Cairo nut & spice blend. 2. Place sheet trays in an oven at 210° for 6-8 hours. (I place them in the oven just before bed and remove them in the morning.) Remove from oven, let cool, cover and refrigerate until ready to use. 3. Slice a french baguette on the angle & drizzle lightly with olive oil. Then sprinkle lightly with sea salt. Toast the slices in a 350° oven until lightly browned. Remove and cool the toasts. 4. 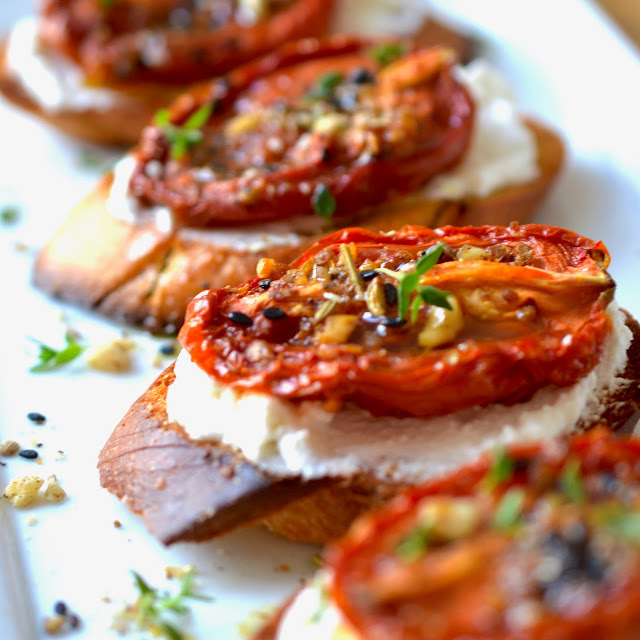 Smear each toast with a generous amount of ricotta cheese. Top each with a tomato (should be at room temperature). 5. Finish each toast with slight drizzle of extra virgin olive oil, sprinkle with a bit more Cairo blend and top with fresh thyme. Serve & enjoy! 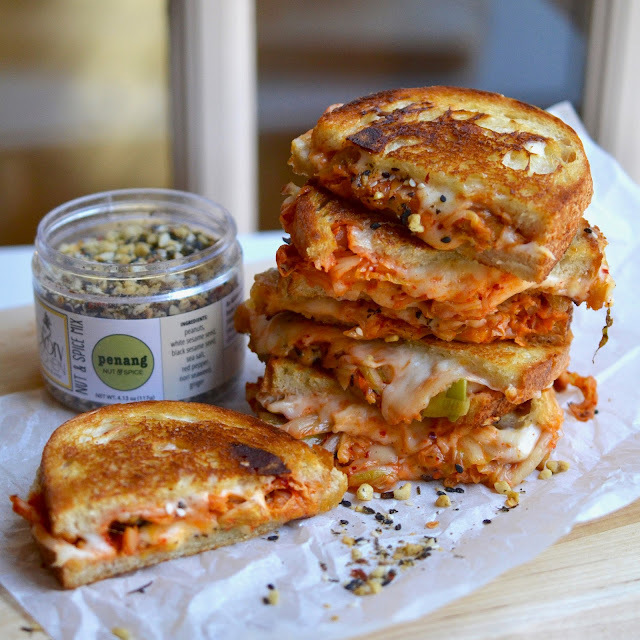 Note: Any of the Glory Kitchen nut & spice mixes can be used with this recipe. 1. Slice the grape tomatoes lengthwise, spread them onto a parchment lined baking sheet, drizzle with olive oil & sea salt and place them into a 350° oven to roast for about 15 minutes. Check after 15 minutes, some may be a bit crispy but do not let them burn. Remove from the oven as soon as they are browned a bit but not completely dry. Allow them to cool completely. 2. Heat a sauté pan on the stove top, add 2 teaspoons of olive oil to the bottom, then add the panko bread crumbs, a pinch of salt, 2 teaspoons of Umbria nut & spice mix and stir over the heat until they lightly toast. Remove from the heat, allow to cool a bit, then add the shredded parmesan, toss and set aside to use as a topping over the prepared spaghetti squash. 3. 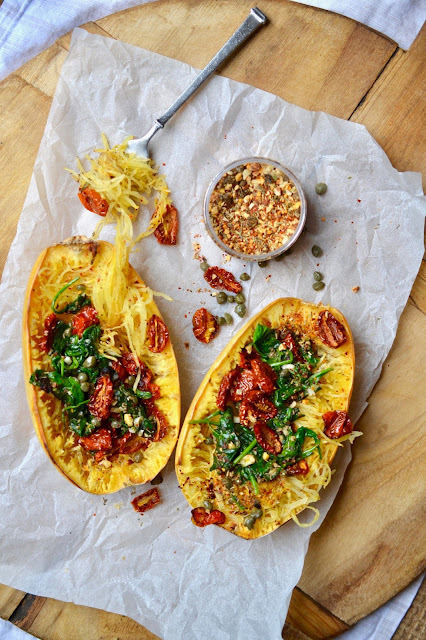 Take the spaghetti squash and place in the microwave for about 2-3 minutes to soften the flesh enough to slice through with a large chef's knife. When it is cooled a bit from the microwave, slice it lengthwise into two pieces. Clean the seeds out of the cavity (hint: I always use a grapefruit spoon which has serrated edges and it helps with the scraping). Using your hands, rub the inside cavity with a drizzle of olive oil and rub it well. Sprinkle the inside cavity with a bit of sea salt and a bit of Umbria nut & spice mix. Place the squash face up on a baking sheet and bake in a 400° oven for about 20-30 minutes. Remove and allow it to cool a bit. Scrape the inside to loosen the strands of squash but leave them in the squash cavity. 4. In a saucepan, add a bit of olive oil & heat through. Add the minced garlic and cook a bit without burning. Add the fresh spinach, the capers, about 2-3 teaspoons of the caper liquid and a sprinkle of Umbria nut & spice mix. Add the roasted tomatoes which were set aside. Remove from heat and mix well. Toss the tomato/spinach mixture into the cavity of the spaghetti squash, top with the crunchy panko crumb mixture, a bit more of Umbria nut & spice mix, and serve. This only serves 2 persons but can be doubled or tripled to serve 4-6. All photos courtesy of Glory Kitchen and used with permission.